The other day I caught myself laughing out loud at a pair of brothers who got caught up in an impressive scuffle resembling that of an MMA fight. You've seen this sort of fight before. The younger boy was holding a ball. The older boy took the ball. The ball went flying across the gym. The younger child went berserk, kicking and screaming as the older boy ran away laughing. I didn't really mean to laugh out loud at the scuffle. It's just that it looked so familiar. My boys are becoming good friends, which also means that they are becoming quite a rough-and-tumble little duo, resulting in approximately 73 fights per hour. I've done the math. This figure is entirely accurate. I left the room for two seconds, and a little MMA ensued. Brody took something from Brecken. Or maybe it was Brecken who took something from Brody. Doesn't matter. I heard some screaming (it's almost always Brecken-screaming), and then I heard a slap. A Brody slap, specifically. I sent Brody to his room for the 7th time. I told him to stay there and not come out (while secretly trying to figure out my next move). To buy some more time to consider my tactics of communication with the boys, I made a trip to the garbage can with some trash. When I got back, the door entering my house from the garage was locked. Again, this was Saturday morning, which means I wasn't necessarily dressed for a trip to the neighbor's house for fun. We don't keep keys on the outside of our house, and my phone was inside. So I yelled and banged on that door like a crazy person. Luckily, our neighbors live far enough away that they (hopefully) didn't hear all of the madness. I told Brecken to unlock it, and it appeared he was trying to turn the handle. I tried to tell him to get Brody while yelling through the door. Poor guy...he just didn't understand. I made some more noise at the back door, then went back to the garage door because it's easier for little hands to unlock. Finally Brody came to the door and I told him to unlock the door. About 10 minutes after the whole ordeal started, I was back in the house thinking of ways to avoid that situation in the future. By that time I had forgotten about the fight that sent Brody to his room. I thanked him for helping me and we went along with our day. And Monday, when I was cooking in the kitchen and hearing lots of giggles from the living room I thought, "We've made it. The boys are officially happy friends." I went into the living room moments later. Nope. 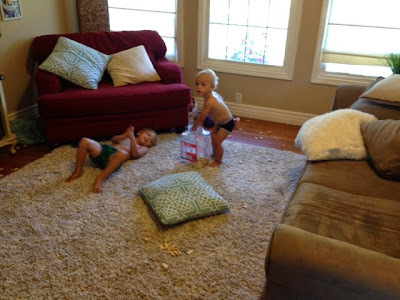 They were just having an animal cracker fight. In short, if you ever see me laughing at your kids when they're doing something ornery or ridiculous, please know that I'm not laughing at you. I'm only laughing because the scenario is very familiar to me (and I'm glad that, for once, I don't have to come up with a way of dealing with it). Someone should have been around to laugh when I was locked out of the car or the house (three times total now). I sure wasn't laughing then, but it would have helped if someone else was.